Last week we saw Ruth Ellen use this same BoBunny Bandit paper for her cute layout show casing the CottageCutz Raccoon. I couldn't resist using this cute paper to make a card showing the CottageCutz Squirrel/Whimsical. I think it's pretty cool to be able to take dies from a Camping release and adapt them for all kinds of other occasions. I made the nut look Valentiney by cutting it out of pink cardstock and putting a little heart punch piece on it just like they did in the paper. So whether your making camp layouts or not these dies are so versatile for all your projects. Kay this card is soooooooooo cute!! 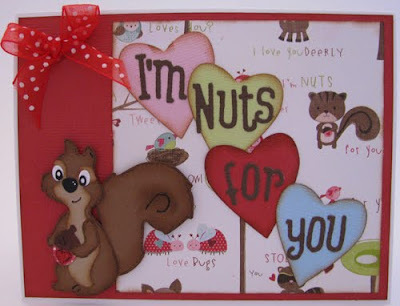 I love the different colored hearts for the sentiment and the squirrel is perfect with the paper! And by just changing the color of the acorn you adapted him for a whole new purpose. Great job! What an adorable card. Love your little squirrel with his heart acorn.... very cute!!!! What line of paper did u use. Wow, this is soooo cute.